Storm-Proofing Your Home - Scarsdale Premier Insurance Agency | Advocate Brokerage Corp.
As the end of summer fades and our fun filled Labor Day weekend becomes a memory, we move deeper into storm season. Some storms are minor and blow over quick, but others can be devastating. We want you to be prepared in the event of a severe storm, so here are some tips on how to prepare your home. Your doors on your home are your first line of defense against a storm. Make sure that all entry doors are secured with a 2 inch deadbolt lock & at least 3 hinges. Be sure the hinges are secured with screws long enough to penetrate the wall framing. Garage doors are the largest opening to your home, so make sure that they are protected! Typical garage doors can withstand forces of 50 pounds per square inch. 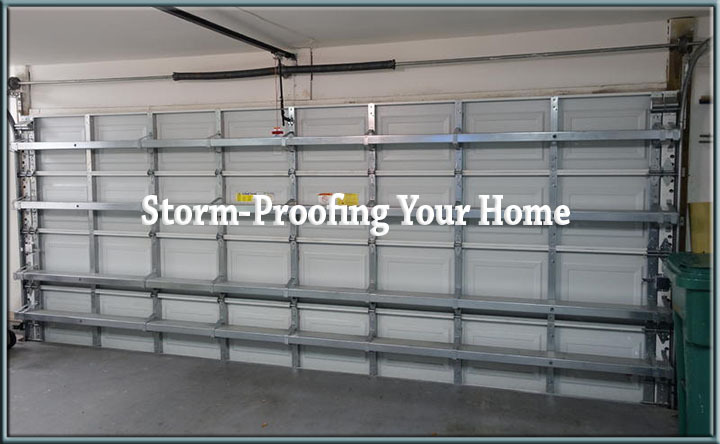 If you have oversized garage doors or a multi-car garage, you may want to invest in vertical bracing for your doors. These braces will help to secure the doors in the event of high winds. These braces are usually made of metal, but wood can also be used. Windows shattering from storm debris can cause serious injury. Although impact resistant windows are more expensive, the investment is worth the benefits;especially, if you own a home in a windstorm prone area. These types of windows can even be required by building code in certain areas, although this mainly applies in areas prone to severe storms such as Texas and Coastal Florida. Normal roofs are installed using long nails, but this style is prone to damage from high winds. For a more secure roof, request that your roof be installed using hurricane clips, which create a stronger connection between the roof and the house. Raid the old file cabinet in the corner and put your important documents in a fireproof safe or a safe deposit box. In the event of a loss, it will be much easier to recover documents such as passports, social security cards and wills. Prepare for the worst. Create a storm shelter in your house, whether it is a bathroom or office with no windows where your family knows to go during the storm. Also, stock up on supplies! Finally, check your coverage. That is where we can help! As your insurance Advocate, we want to help keep your family safe in the event of a storm. Make sure to check your policy for coverage relating to storm damage such as flooding, hurricanes or tornados. If you have any questions, feel free to give us a call. We can help you identify exclusions, and find the right type of additional coverage if needed.